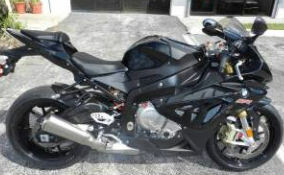 The 2012 BMW S1000RR for Sale has the classic black paint color and is in "Like New" used condition. It's covered under factory warranty until June! This motorcycle has the premium package and is equipped with Rizoma turn signals, Rizoma brake reservoirs, Rizoma levers, Mogo track GPS navigation, Lojack, a Rizoma oil plug and Rizoma front axle sliders. This is a "racing proven" sport bike that handles beautifully on the road. The RR has a reputation of being a racing bike that can be ridden with a license plate on the city streets and highways. This motorcycle is packed with racing power and has an aluminum bridge-type frame, radial brakes, a super sporty tail-up nose-down design. It comes in super hot colors (but I love the black paint color option) and 4 riding modes that adjust power delivery, and throttle response. If you have any questions regarding the BMW S1000RR or if you would like to make an appointment to see the bike in person or make payment and pick up you can do so using the space below that has been provided by GoGoCycles Used Motorcycles for Sale and PLEASE do not neglect to include your contact information in your email or to provide a phone number or email address so that I can respond with answers to your questions or set up an appointment as quickly as possible. In my opinion there is not a better deal on a used S1000 rr for sale as this one in Florida FL, on Craigslist or in an Ebay auction so hurry and make an offer before this opportunity to pick up a great bike (don't forget about our financing and layaway plan) gets away from you! GoGoCycles would also encourage our biker friends to write a review of the 2012 BMW S1000RR for Sale or share any thoughts and/or opinions to make potential buyers aware of any problems that are commonly associated with this brand or to highlight its positive features and help our visitors make informed decisions. My asking price is $14,895 which is great for a practically new bike of this type so email before it's gone and don't forget to mention that you found this ad on GoGoCycles' Motorcycle Classifieds www.gogocycles.com using the comments forms located on this page.